With the Breeders’ Cup returning yet again to California this fall, the state’s favorite son is the parasol-shaped straw that stirs the frothy drink. ETOBICOKE, Ontario – Saturday’s Grade 1, $1 million Woodbine Mile headlines a terrific weekend of turf racing, with five graded stakes on the grass and four fees-paid berths to the Breeders’ Cup up for grabs. ELMONT, N.Y. – Horse vans were streaming in and out of the stable gate here Wednesday morning as the transition from the Saratoga summer to the fall at Belmont Park continued. SARATOGA SPRINGS, N.Y. – Trainer Jonathan Sheppard’s streak of winning a race at Saratoga for 47 consecutive years is in jeopardy. 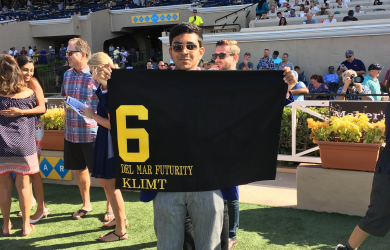 DEL MAR, Calif. - In two starts at Del Mar this summer, Belvoir Bay had a race to forget and one to remember. DEL MAR, Calif. – In any other year, Enola Gray might be the best 3-year-old filly in California. But this is Songbird’s season, and everyone else is playing catch-up.